is one of the most popular software for Windows Mobile phones. This software allows your laptop (or desktop) to go online wirelessly by connecting it to your Windows Mobile Phone through the Sync cable, Bluetooth or even Wifi. PdaNet goes through the unlimited data plan on your phone and does not require any extra service. Supports all Windows Mobile phones. Simply download and install the software from your computer and it will be online within a few seconds. 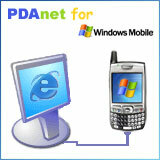 PdaNet supports Windows 7/Vista/Windows XP. Only Bluetooth DUN is available for Mac. Click here if you have a non-Windows Mobile phone. Check out the Troubleshooting and FAQ page if you run into any issues using PdaNet. Note: this license does not cover PdaNet for other platforms such as Android or iPhone. 1. Make sure ActiveSync is installed on your computer (not needed for Vista). 2. Download and install PdaNet on your Windows computer. 3. At the end it will prompt you to install to your phone. 4. Click on the PdaNet tray icon and select "Connect". The dial up process will be started automatically and connect your PC to the Internet, no extra setup or configuration needed! Copyright ©2003-2015 June Fabrics Technology Inc. All rights reserved.